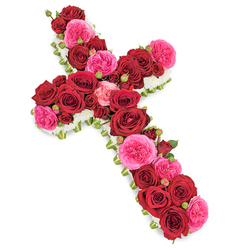 There is a huge range of funeral flower tributes available to choose from so whether you know precisely the kind you like to order to show your affection for someone, or you have no idea where to start, Handy Flowers is here to help. Ordering funeral flowers can be a very challenging time, but you can rely on our florists to offer professional, impartial advice about the most fitting funeral tribute for your needs. It could be something small and classic, or large and exotic. We will work with you to help you decide! 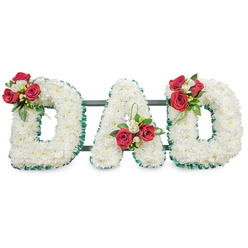 At Handy Flowers we know that picking a floral tribute for someone special to you can be hard. Especially with so many options. And we are proud to be able to offer a huge range of funeral tributes including letter tributes, casket sprays, and posies. But we want you to be confident that you’ve chosen the most appropriate option for your loved one. That is why we will discuss all of the options with you, as well as listen to your personal preference and needs. Together we will choose something that really represents the life and energy of the person you are honouring. 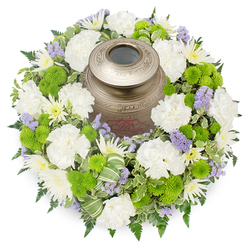 Give us a ring on 020 3409 3030 benefit from the wide variety of floral tributes for funerals we have on offer! If there is one guiding rule about choosing the most fitting funeral tributes for someone you’ve lost, it’s that it should be all about them. We actively encourage our customers to put some personality into their floral tributes. And there are many ways you can do this. You can use letter tributes to spell out what they meant to you. Or we can include something that symbolises their hobbies in life. We can even include photos or other mementoes into your funeral tribute, to remind everyone who sees it what your loved one was like in life. For advice and to discuss your needs, why not call us on 020 3409 3030 today? For many people, while they like the idea of making a funeral flower tribute personal to the individual they are remembering, they also know that a classic floral tribute would be the best option. So how can you make a traditional funeral bouquet personal without adding any photos or other mementoes? We suggest using that person’s favourite flower instead. It is a simple, subtle yet powerful way to mark someone’s life and honour their memory. 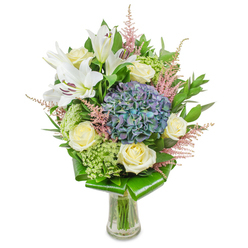 At Handy Flowers we are fortunate to have access to fresh flowers of virtually all kinds, so no matter how exotic your loved one’s favourite may have been, we can add it to their funeral flowers for you. If you are busy planning a funeral for a loved one you may be quickly coming to realise that there is little that is “cheap” about the process. From the casket to burial payments, and finding a venue to host the wake, we know that the costs can begin to mount up. That’s why we make sure to offer all of our customers access to cheap funeral tributes, but without cutting corners on quality. You get the freshest flowers for a funeral, arranged by highly trained florists, but at a much lower rate than any other flower shop in London. Your loved one deserves the best funeral flowers, and you shouldn’t have to pay over the odds to get it for them. 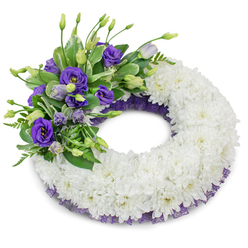 When you choose to order funeral flower tributes from our team we are pleased to offer a complete service to help reduce some of the stress at this difficult time. This service not only includes consulting with you about the right funeral flowers but also creating them for you. But we can also arrange to send funeral flowers on your behalf too. That means that once you’ve placed your order, you can count on us to organise delivery, without you having to worry about a thing. 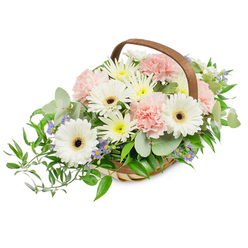 After suffering a loss we know that you will be facing a great deal of stress, as well as grief, so we are here to do whatever we can to take some of the burden from you when it comes to organising funeral flower tributes. When you speak to our florists about funeral flowers they will work to make sure that everything is handled on your behalf. Unless you wish to be kept in the loop in which case they will provide regular updates about the process and progress of your funeral tribute delivery. And if you have questions or concerns they are always on hand to help, so trust us to help you get this right. With so much to organise for a funeral, whether you’re planning it or just attending, the last thing you need to worry about is how to send funeral flowers and make sure they arrive. With our support, you don’t have to worry about this because we will organise your funeral flower delivery for you. We can organise to have funeral flowers delivered to the funeral home for travel in the hearse to the service. 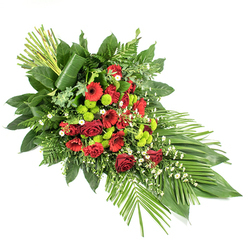 Or we arrange funeral flower delivery direct to the site of the ceremony. Simply tell us when and where, and we’ll do the rest!